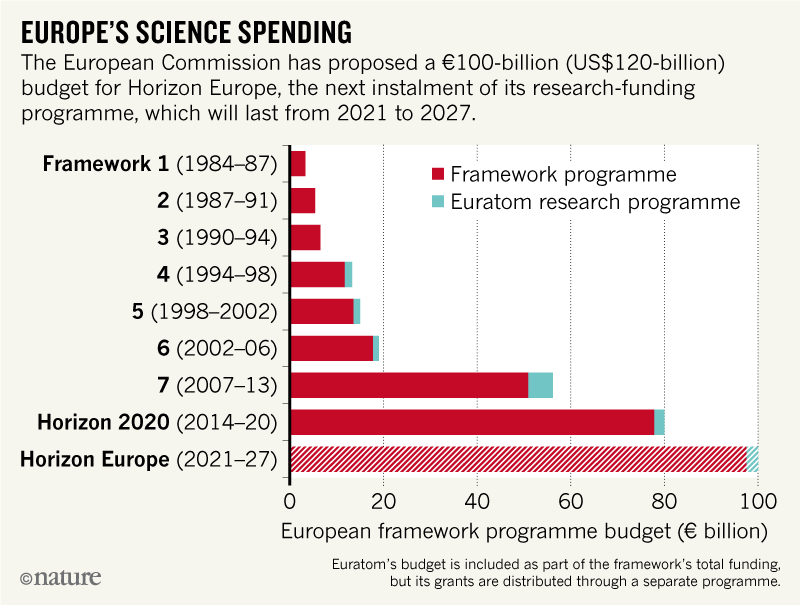 Initial funding plans for the seven-year Horizon Europe science initiative get a lukewarm reception. The European Union is planning to spend €100 billion (US$120 billion) on its next major research-funding programme, for 2021 to 2027 — a disappointment to some scientists and policy groups who were hoping for up to 60% more. The budget does not include a contribution from the United Kingdom, whose departure from the bloc in 2019 is likely to shake up the distribution of funds among the remaining 27 EU countries. The European Commission issued its opening budget proposal for Framework Programme Nine — newly named Horizon Europe, and the successor to the current programme, Horizon 2020 — on 2 May. The announcement marks the start of tough negotiations between the European Parliament and the Council of the European Union, which comprises government representatives from EU nations. The proposed €100 billion, which includes €2.4 billion for the Euratom nuclear-research programme, is an increase on the €77-billion pot for Horizon 2020, which began in 2014 (see ‘Europe’s science spending’). However, a report by influential academic and industry experts, published last July, had urged a doubling of the budget for the next framework programme. And in March, 13 science and higher-education organizations, including the European University Association (EUA), which represents more than 800 institutions, also demanded a €160-billion budget. 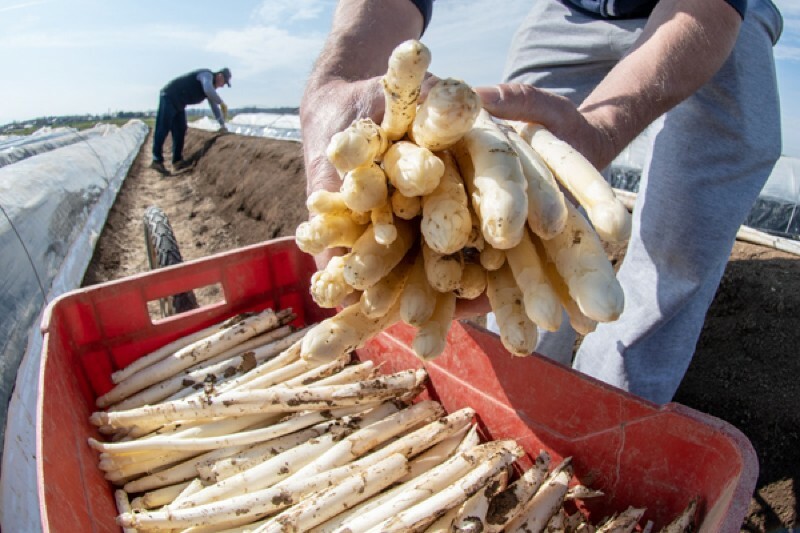 “The increase is good, but it’s not at the level we would consider suitable,” says Enora Bennetot Pruvot, deputy director of governance, funding and policy at the EUA in Brussels. In a statement in response to the budget proposal, the EUA also pointed out that some new funding streams in the programme, such as the €3.5-billion InvestEU fund for start-ups and businesses, will not be for conventional academic research, limiting funding for basic science. The European Parliament’s Industry, Research and Energy (ITRE) committee had advocated for €120 billion and says that it will campaign to increase the budget in upcoming negotiations with the council. “This is the level we need for securing Europe’s global competitiveness and technological leadership,” says Christian Ehler, a German Christian Democrat Member of the European Parliament, who is an ITRE committee member for the European People’s Party. The budget debate is likely to heat up over the summer. Usually, the member states, represented by the council, want to reduce the budget, whereas the European Parliament wants to increase it. During negotiations over Horizon 2020’s budget, the parliament demanded €100 billion and the European Commission €80 billion. The final sum was settled at €77 billion. Horizon Europe’s final budget will be strongly influenced by Brexit; the United Kingdom is set to leave the union in March 2019. The latest proposed budget does not include any British money, and the commission says that “the departure of an important contributor to the EU budget will have a financial impact”. UK researchers have been the biggest winners from Horizon 2020 so far, earning about €10 billion in grants. “With the UK leaving the EU, we knew it was going to be difficult to get the €160 billion we would have liked to see,” says Laura Keustermans, senior policy officer at the League of European Research Universities in Leuven, Belgium. But “it could have been worse”, she says. The United Kingdom could choose to join Horizon Europe as an associated country. Like non-EU nations including Norway and Switzerland that contribute to Horizon 2020, it could pay a subscription fee linked to its gross domestic product, which could boost the budget. Horizon Europe retains the three-pillar structure of Horizon 2020, the main programmes of which are the €13-billion Excellent Science stream, home of prestigious European Research Council grants for basic research; the €13.5-billion Industrial Leadership stream; and the €7.5-billion Societal Challenges programme, which include seven topic areas, such as food, energy, climate and social science. The new framework also includes ‘missions’: large, multidisciplinary programmes to tackle big societal questions, which will cut across the three pillars. Another addition is the European Innovation Council, intended to be a European Research Council for entrepreneurs. Researchers welcomed a doubling of the budget for the academic-exchange programme Erasmus+, which would grow from €16.5 billion to €30 billion. Some also praised the fact that the proposal includes €10 billion diverted from the EU’s other big budget area — farming subsidies — to assure a cash increase for Horizon Europe. However, this cash is earmarked for research into food, agriculture and rural development, and some academics think this will trim resources for other areas. The full proposal for Horizon Europe is expected in June. Negotiations between the council and parliament could stretch over the next two years, but halfway through, in May 2019, some of the most ardent defenders of Horizon Europe’s budget increase could be booted out of the parliament during EU elections. “Now the game will really start, but unfortunately the European Parliament is soon to be dissolved,” says Jerzy Langer, a physicist at the Polish Academy of Sciences in Warsaw. Clarification 04 May 2018: This article has been amended to make clear that the descriptions and budgets of the the framework programme’s three main pillars apply to Horizon 2020, not Horizon Europe.